Posted May 30th, 2016 by Jenny & filed under Uncategorised . Have you been hearing and seeing a lot of microblading on social media lately? 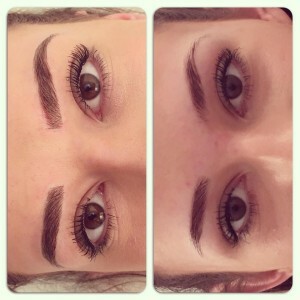 Microblading has been growing fast across the semi permanent makeup industry over the past few years and is now becoming very popular for technicians and clients. After 5 years of being qualified in tattooing, I was intrigued to find out more about it. I like to keep as up to date as much as possible with all treatments, especially semi permanent makeup, as it is ever growing and fast becoming a very popular treatment. After completing my Medical and Elite days with Karen Betts and Nouveau contour, I felt that it was time to extend my menu in this field as you can never stop learning! So I booked myself onto Rebecca Chung’ s training in London in February. Rebecca is an international master trainer in microblading and I must say I was very impressed with her and her amazing work. The course was designed for experienced semi permanent technicians, which is always great to meet other techs and share skills whilst also thoroughly enjoying the course. I learnt so much more about tattooing and this new technique, that I couldn’t wait to bring it back to the salon! 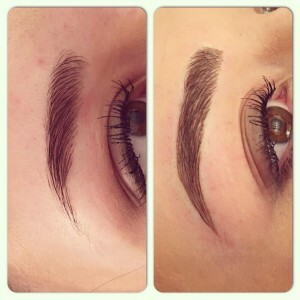 Microblading is a form of semi permanent makeup using a hand held tool manual technique. 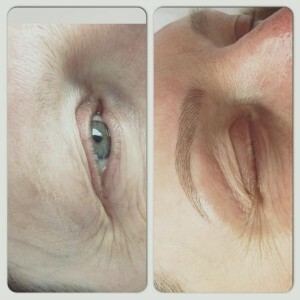 Traditional semi permanent makeup is performed using a machine. I still use and enjoy both techniques. With Microblading you can produce a very natural hairstroke or feathered eyebrow with fine and crisp strokes. These hairstrokes heal more crisp in the skin as there is no vibration from a machine technique used. So if you are looking to enhance your brows but still want a natural look then microblading may be for you! I’ve added a few pictures below which are also in the gallery for you to see the results. Semi permanent makeup is bespoke to you and is discussed and created together so suit you and your face.